4 out of 5 stars on a slot machine. I recently saw some mystery writers including Ace Atkins and Megan Abbott at an event and signing in St. Louis and got one of my proudest moments when I met Atkins and mentioned that I liked the homage he’d done to True Grit in his first Spenser novel Lullaby. “You know, you’re only like the third person I’ve talked to who picked up on that, and Megan Abbott there was one of the other ones,” Atkins told me. This made me so happy that I walked around with a big stupid grin on my face for the next week. Nothing like the current writer of one of your favorite characters telling you that you picked up on something that few others did to boost the old ego. I don’t think that I’ve got any equally insightful observations about Wonderland so I guess I’ll just have to stick to a basic review. Spenser’s old friend and former boxing mentor Henry Cimoli needs some help. Someone is trying to buy out the tenants of his building and they’re using hired thugs to intimidate people into selling. With Hawk out of town, Spenser relies on his protégé Zebulon Sixkill (a/k/a Z) to back him up. When it turns out that someone is looking to buy Henry’s building as part of a larger scheme to bring a casino to Boston, Spenser and Z find themselves in the middle of a mess that involves gangsters, politicians and a Las Vegas gaming tycoon. 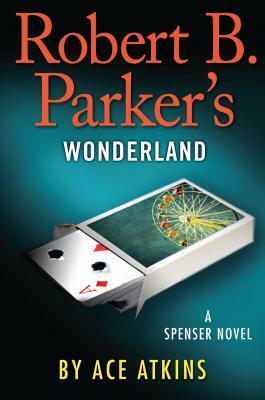 In the first Spenser novel that Atkins wrote after taking over for the late Robert B. Parker, he took the character back to basics and proved that he could write a compelling story that wasn’t imitation but rather a new phase that kept familiar elements. In Wonderland, Atkins shows that he isn’t content to just keep Spenser in the same cocoon that RBP had put him in during the later years of his career. One sign that Atkins isn’t playing it safe is that in only his second book on this series is how he strips away two of the main supporting characters for most of the book. Hawk is off on his own mysterious mission in Miami, and Susan spends a lot of the book out of town for work. This means that Atkins has to make Spenser work without his trusty sidekick and with minimal conversations with his girlfriend. Like many long-time Spenser fans, I believe that the less Susan, the better, but I still think that limiting their interactions was a brave choice because it means that Atkins deliberately put himself in a position where Spenser has to carry the book without two of the biggest RBP crutches. It also allows the development of the Z character that RBP had introduced in his final book. Spenser took Z under his wing and the young man is showing a lot of potential as a tough guy detective, but he still has things to learn. There’s a nice sub-plot with Z trying to deal with an incident where he feels he didn’t meet expectations, and his disappointment in himself threatens to undo the progress he’s made. If there’s anything unsatisfying in the book, it’s that it almost seems like a set-up for future stories in some ways. However, that’s not entirely a bad thing. RBP had Spenser in such a state of stasis for so long that getting some plot that may carry over to another book is welcome at this point. Plus, there's the potential for a future confrontation between Spenser and one of the other regular characters that is intriguing. Ace Atkins shows again that he was the right writer for the job to continue the Spenser stories.